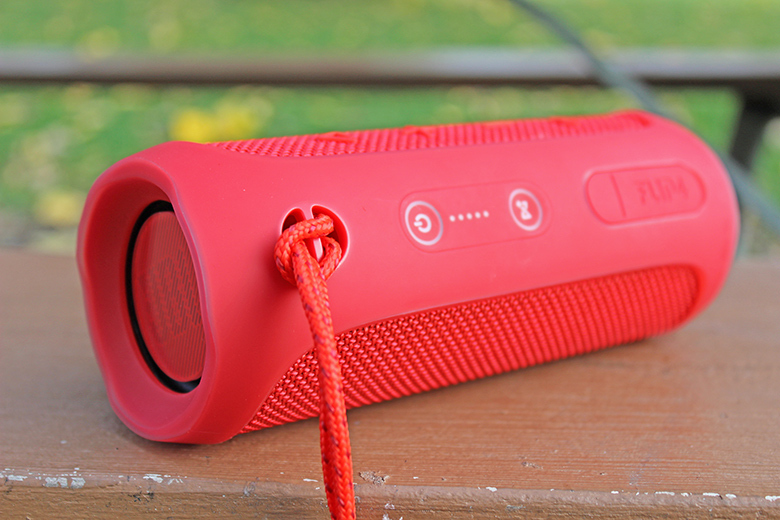 Portable speakers are booming, with new models popping up every couple months. All of them are fighting for the crown, including the all-popular JBL. 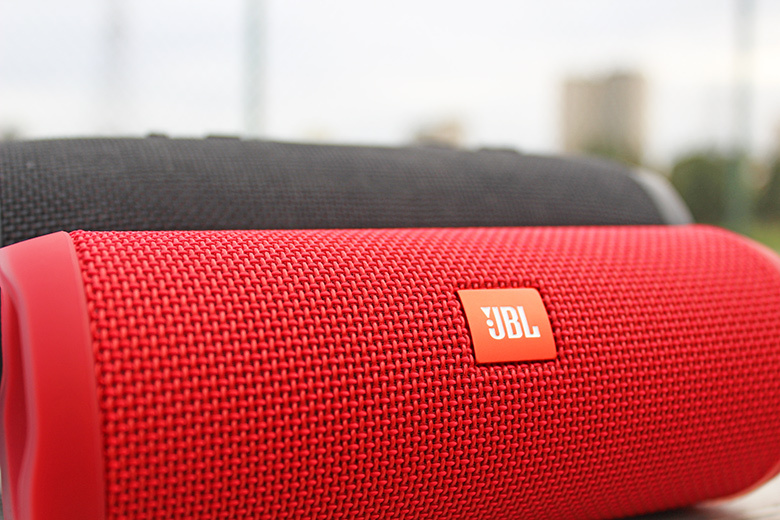 In this review, we’ll talk about the JBL Flip 4’s sound, design, packaging and accessories, specs and more. If you want to see how it stacks up, see our best wireless and Bluetooth speakers. Recently, we’ve been expanding our review gear to some pretty strange reaches, going beyond our usual comfort zone of high-end audio products. We wanted to see what was so great about all these portable, waterproof, seemingly world-changing pieces of gear. And while we were a bit skeptical at first, we’ve been pleasantly surprised by some of the models we’ve checked out. 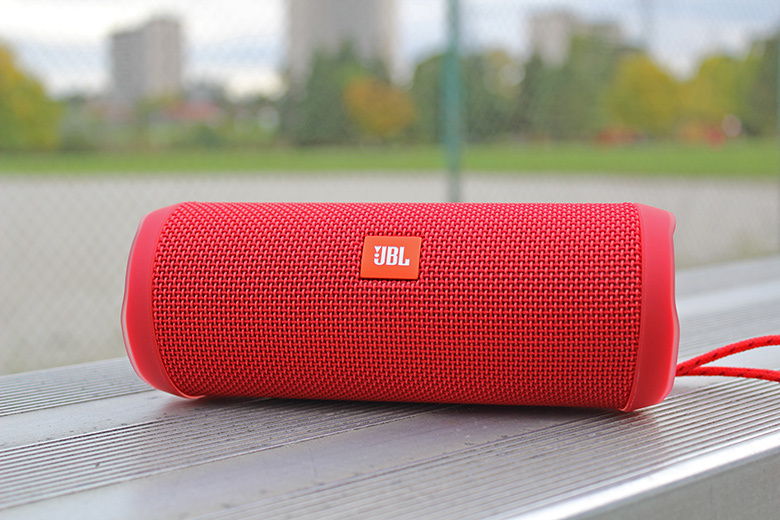 One of which is the JBL Flip 4. Reviewing the JBL Charge 3 (full review here) recently - the big brother to the Flip 4 - we were interested to see what JBL could do with a more compact model, like the Flip. 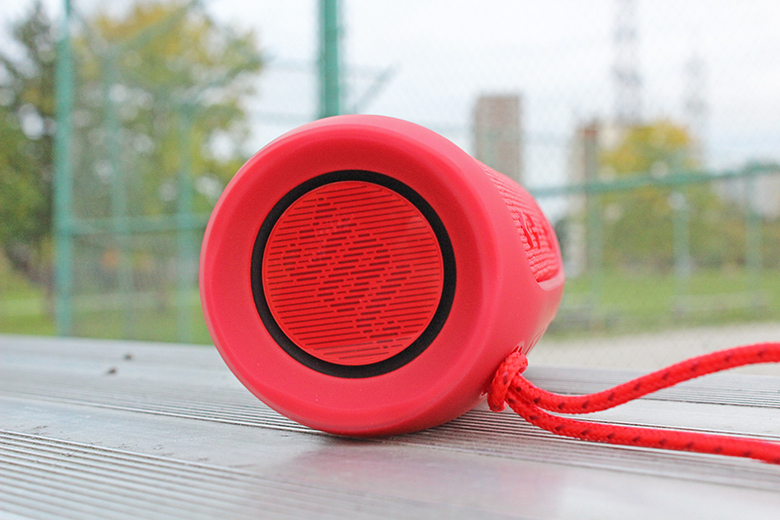 The original Flip was released in 2012, and was one of the first truly portable speakers to hit the market. 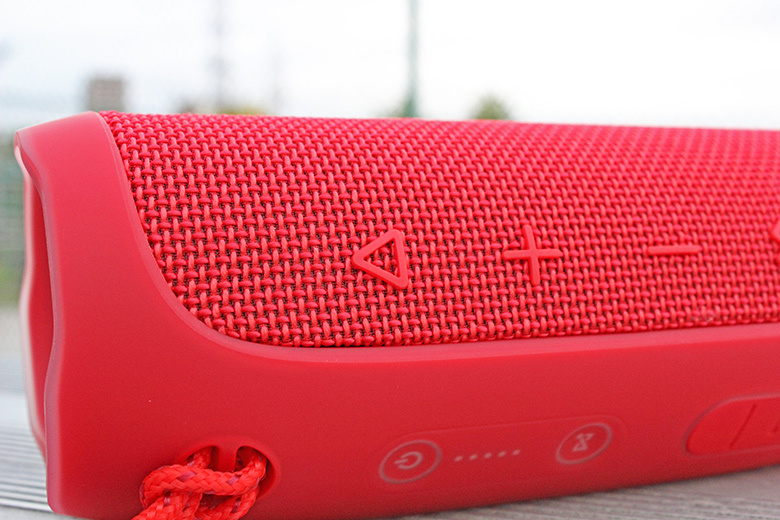 It was fairly popular, and inspired models like the Beats Pill and the Bose SoundLink Mini. Though it was innovative, it had some major sound and design downsides, which we are happy to report have been improved with the upgraded Flip models over time. In comparison to the most recent Flip 3, the Flip 4 has better bass response, more power, a better physical design, better battery life, and has been made waterproof. We’ll talk about all these points below, but let’s get started with the sound. We’d be crazy to say the sound quality of the Flip 4 is anywhere near some popular wireless models - like the $199 SONOS ONE (full review coming soon) - but we have to admit that, for a speaker smaller than your forearm, it doesn’t sound half bad. The overall sound quality is decent, and can suit some genres quite nicely. You might miss out some of the intricacies of your tracks, based on the fact that this speaker only has two eight-watt drivers handling all the frequencies, but it can easily suit your daily on-the-go listening needs. Despite the Flip 4’s appearance of a 360-degree speaker, the drivers are actually located in the center, facing forward, with passive radiators on either end. While it might look like this is a 360-degree speaker, like the $119 UE BOOM 2 (full review coming soon), the sound comes out of the front, not all sides. This isn’t necessarily a bad thing, but it’s a downgrade from the true omnidirectional sound you get from some portable speakers. This means you have to position the speaker either facing directly towards you, or you’re going to lose some volume. You also won’t be able to stand it up like the BOOM 2 series without affecting the radiators. This won’t necessarily limit your use, but you might have to rethink where you place the speaker. The Flip 4 doesn’t have the same amount of power as it’s big brother - the $120 Charge 3 - but it does put out enough sound to fill a small space. You can easily entertain a small gathering or put it in the center console of your car - if you’re the kind of person who still drives a 1980s Volvo with built-in tape deck. Our main complaint about the Flip 4’s sound is that it can tend to distort when pushed to the absolute max volume. Though we don’t recommend listening to your music as loud as humanly possible, we still like to push our gadgets to the max. Sadly, this little guy couldn’t hold up against some larger portable speakers - like the UE MEGABLAST - but that speaker has four drivers, two radiators, and costs $175. The bass on the Flip 4 won’t impress EDM or hip-hop fans. This speaker simply does not have enough power to handle lower frequencies, and most bass is receded behind the rest of the sound. It definitely exists, and you’ll be able to hear the low notes on more bass-heavy tracks, but it will be missing that thump you want from the new Travis Scott album, putting more emphasis on the mids and highs. The bass notes don’t sound distorted or harsh, just a bit dull in comparison to the rest. You’ll notice them more on bass-focussed tracks, where the artist pushed the low-end to the limits, and it will sound punchy - just not the low rumble we like to hear in our music. As for the high-end and mids, this is where the Flip 4 shines. You might not get a full range with this portable speaker, but you’ll certainly be impressed with the amount of power it can put behind a solid vocal track. Perhaps it’s most redeeming feature, the Flip 4 handles vocal tracks with ease, playing them loud and clear. They have a smoothness to them that makes them easy to listen to. The highs are reasonably bright - not unlike the $95 UE BLAST - and will become harsh at higher volumes. We recommend listening to the speaker below max volume, as we mentioned before, and avoiding songs with a lot going on in the high end. Be aware: effects and string instruments will pierce through all other sounds at high volumes. Overall, in comparison to the Charge 3, the Flip 4 doesn’t have the same power or ability to play bangers, but it does well as a handheld, portable speaker. If you have the opportunity to pick that one up, and don’t mind a little more weight to carry around, we’d recommend spending the additional $24 for the Charge 3. But, if you’re just looking for something to throw in your handbag on the way to the pool, the Flip 4 will suit you fine. Similar to the Charge 3, the Flip 4 is just a small, cylinder-shaped speaker. A threaded grille covers the majority of the speaker, while the rubber casing surrounds the sides and back. The grille has a texture to it that invites the speaker to be held, while giving it a durable feel. Other than the material, there’s not a lot about the design that will wow you - something models like the $123 B&O Beoplay P2 can boast - but we appreciate the consistency with previous models. The Flip 4 is lightweight, compact, and designed to fit into any handbag or backpack. It’s certainly the best option for anyone looking for on-the-go listening or to add a little oomph to your laptop sound. Like we mentioned before, this isn’t a 360-degree speaker, which will affect how you need to place the Flip 4 when you listen to it. But that’s not a deal-breaker. You’ll mostly find yourself reaching for this when someone invites you to a small gathering where no one is really listening to the music, and more-so want something to break the silence. With the drivers on the side and tech within, you’ll find that the weightiness to the speaker is directly in the center. Weighing in at 1.14lbs, this might be one of the lightest speakers you’ve gotten your hands on - boasting a smaller footprint than some headphones we’ve tested, and weighing just a touch more than the $68 UE WONDERBOOM. Controls for the Flip 4 are found on the back of the speaker, where the grille meets the rubber casing, and on the grille itself just beside those. This is also where you’ll find the wrist strap. The first set of controls on the back of the speaker are the power button and the JBL Connect+ button, which we’ll talk more about below. Here is also where you’ll find the ports for micro-USB charging and aux playback. The next set of controls, located on the grille of the speaker, are Bluetooth pairing, volume up and down, and pause/play. This setup is very similar to the Charge 3, but without the addition of the power button in the center. These buttons are easy to use, and have a nice click to them. In comparison to the Charge 3, where all the buttons are located in one strip on the top of the speaker, this setup is slightly more inconvenient for speaker placement. We would have liked all the buttons to be in the same place, but we do appreciate that real estate is limited with such a small device. Most of the controls can also be accessed through whatever streaming or music service you are using; for example, turning the volume up or down on your phone or laptop will have the same effect on the speaker. While this might be a given, or something we’d expect from our gear, it’s not always the case. With the Google Home (full review here), we had to go through quite the work-around to change the volume without going into the apps we were using. Since then, we’ve learned to appreciate the simple things, like easy volume control. Newer JBL speakers, like the Flip 4, can use Siri or Google Assistant for voice commands. To enable this, you simply hold down the pause/play button to activate your smart assistant, and you can control your music, make calls, or do anything you normally would from your phone. There’s also a setting in the JBL Connect+ app that allows you to switch the pause/play button to a smart assistant only button, creating ease-of-use for voice commands. The Flip 4 works well for phone calls, and we don’t have any complaints for making or receiving calls. The microphone is fairly clear, which is a win even some earbuds can’t claim. The JBL Connect app is easy to use and more simple than a lot of apps we’ve seen. It detects any JBL speakers in range that you’ve connected to using Bluetooth, and automatically adds them to your library. From there, you can enable Stereo Mode - turning two speakers into designated left and right channels - or Party Mode, which allows you to connect up to 100 JBL Connect+ enabled speakers together. You can either turn on Party Mode through the app, or by pressing the JBL Connect+ button on the back of the speaker. Pro-tip: If you have older model JBL speakers, they might not be compatible with the new JBL Connect+ features. You will have to check if your speakers can either be upgraded to, or already have, JBL Connect+. 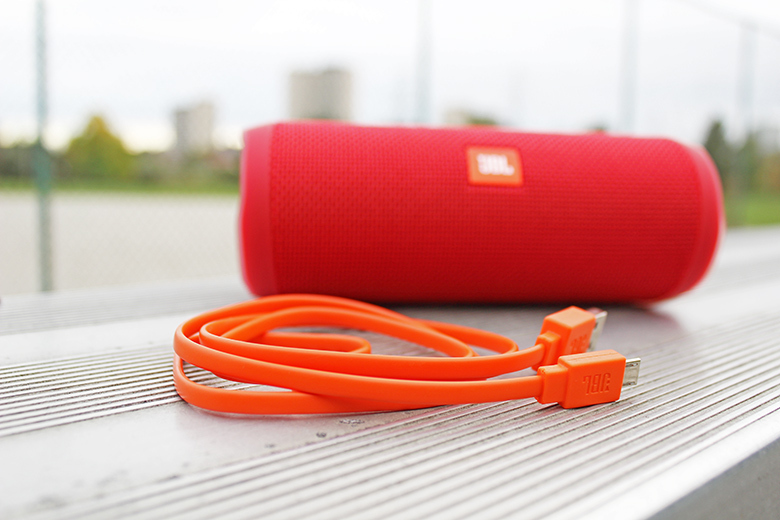 If you don’t plan on using multiple JBL speakers, you don’t even need to use the app. The Flip 4 connects via Bluetooth 4.2 connection - meaning you can connect from any Bluetooth enabled device without having to use specific apps. Furthermore, you can even connect two smartphones at a time to split the DJ duties. The Flip 4 is one of the easiest speakers to set up and use, making it ideal for less tech-savvy people, or someone who just wants to connect and play straight out of the box. As for connectivity, we haven’t experienced any serious dropouts, and were able to leave our Flip 4 in the office while walking around the house without any issues. This isn’t suited as a long-range speaker, based on its power output and recommended twenty-foot range, but you can comfortably leave it on your pool towel as you go for a dive. Speaking of diving: the Flip 4 is IPX7 rated for waterproofing, which means it can be submerged in three feet of water for up to 30 minutes. 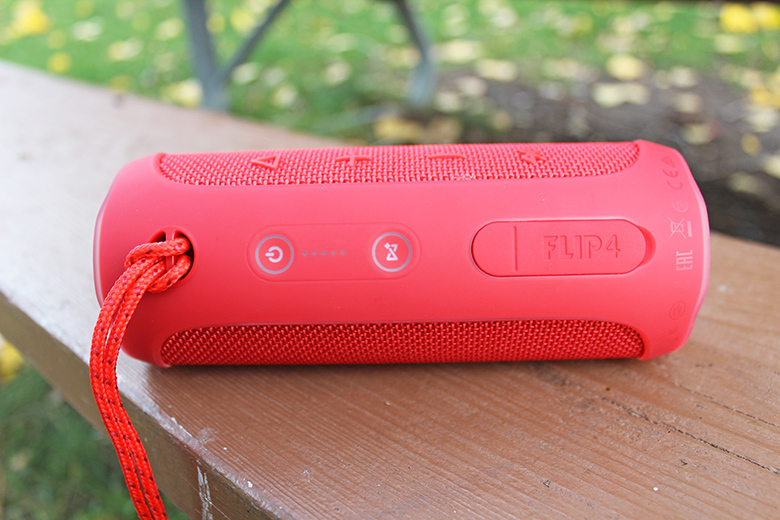 This is pretty standard for portable bluetooth speakers, but we were still pleased with the Flip 4’s waterproofing and durability. We never felt like we were risking breaking it, or worried about water seeping into the ports. The flap on the back of the speaker covers the ports well, with a watertight seal even a tsunami couldn’t conquer. Well, perhaps not, but we’d like to think the Flip 4 can hold its own in that battle. It also doesn’t hurt that replacing the speaker costs less than a grocery run at Urban Fare. It might not be quite as affordable as the $35 Cambridge Oontz Angle 3 Plus (full reviewing coming soon) - yes, that name is a mouthful - but that speaker isn’t waterproof and doesn’t come with half the features found on the Flip 4. The battery life on the Flip 4 is decent, but not ideal. We won’t sugarcoat it and say that the 12 hours it’s rated for are accurate every time. Like most portable speakers, the Flip 4 has a small, 3000mAh battery that is meant to last a decent amount of time when played at a “moderate volume.” Fortunately, you don’t want to blast the Flip 4 to anyways - unless you like distortion - which means you probably won’t drain the battery too quickly. We couldn’t get a consistent battery life test on the Flip 4 because it fluctuates drastically depending on volume, but it generally lasted between four and ten hours. The battery itself requires up to three hours to fully charge - so, be sure to account for this if you want to take it anywhere. You won’t be bringing this on a multi-day hike through the woods with no access to an electrical outlet. For everyday use, we found the Flip 4’s battery life to be perfectly adequate when we were just listening for a couple hours at a time throughout the day. We charged it every couple of nights to maintain the juice, but didn’t have any “oh, no” moments with the battery. Another handy feature is the battery life indicator on the back of the speaker. It’s located below the power button, and consists of five small lights that signify the amount of battery you have left. It’s a small detail, but one we greatly appreciate, and would like to see on more Bluetooth models - like the UE WONDERBOOM, which uses a tone to signify battery life as opposed to a light. 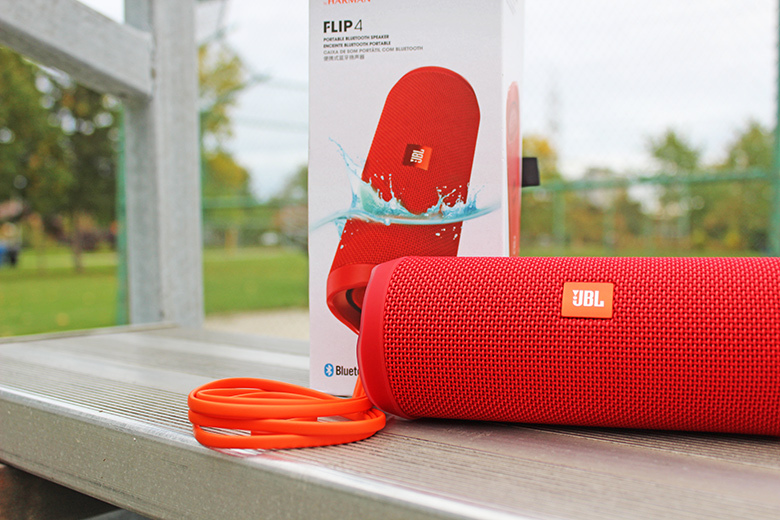 The packaging and accessories for the Flip 4 are almost identical to the Charge 3 and other JBL portable speakers. It comes in a white-and-orange box with a flip top lid, with a foam insert and plastic cradle holding the speaker and accessories package. The box is just as obnoxiously orange as the accessories, which include one single orange micro-USB charging cable. That’s it. We were disappointed to find that the Flip 4 doesn’t come with a charging block or wall plug, considering the fact that this either forces you to purchase your own, or charge the Flip 4 using the USB port on your computer. An included aux cable would have been nice as well, but I guess you can’t expect too much from an $96 speaker. 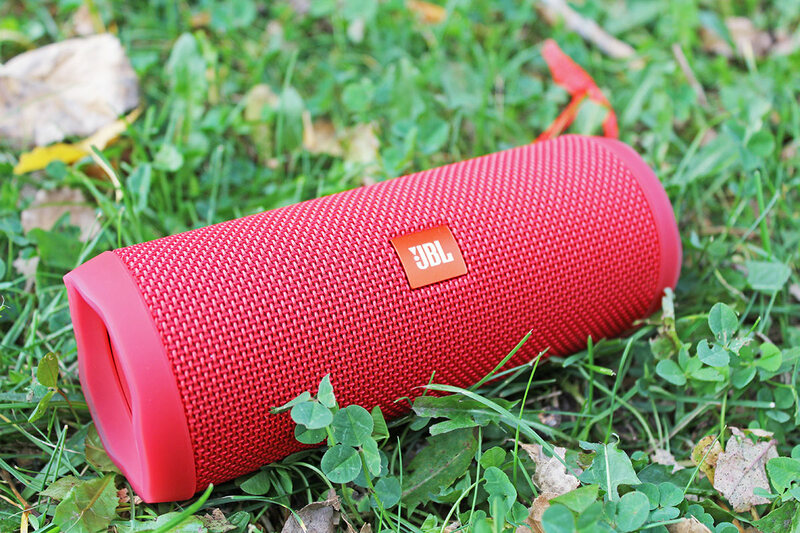 The JBL Flip 4 is affordable and a very good value-for-money. The Flip 4 is compact, lightweight, and great for portability. The controls are intuitive and easy to use - the app too. The Flip 4 has IPX7-rated waterproofing, and can take a beating. The sound quality of the Flip 4 could be a bit better. We’d like the buttons to be all in one place. The battery life could be better or more consistent, with a quick charging feature. The Flip 4 only comes with one charging cable, and no other accessories. 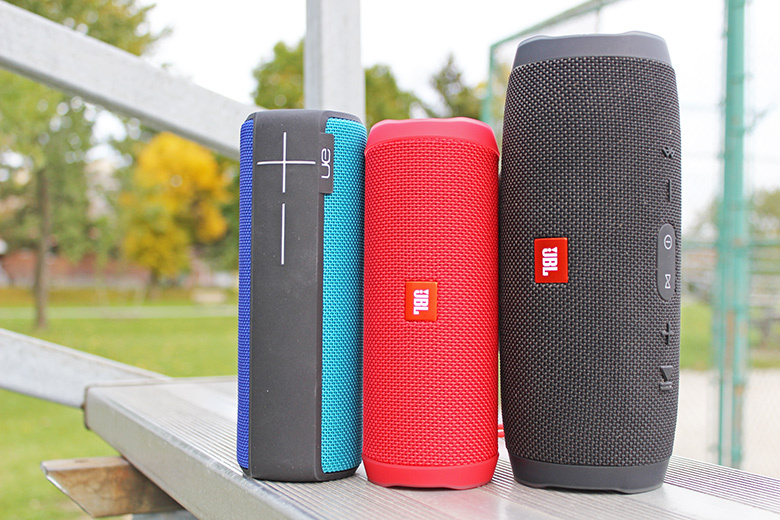 The JBL Flip 4 has a lot of competition in the portable speaker world. So, we are going to start with three main contenders - all of which are within a similar size, price-range, and feature set. The first speaker we’re going to compare is the UE WONDERBOOM. 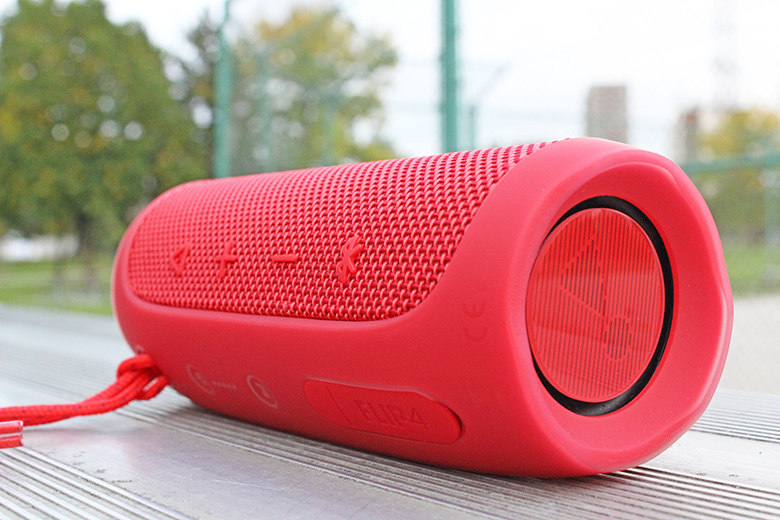 Perhaps the most common comparison to the Flip 4, the WONDERBOOM is one of the smallest waterproof speakers available. 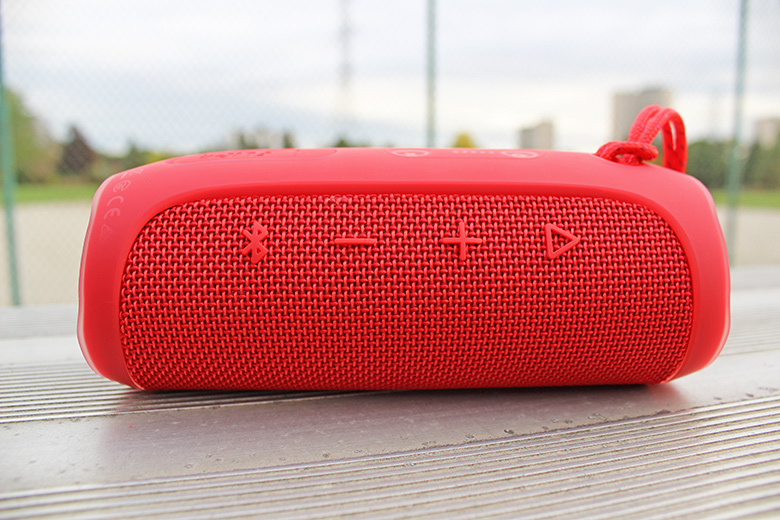 Weighing at less than a pound, the WONDERBOOM is lighter than the Flip 4, and can actually float. The Flip 4 won’t be too quick to sink to the bottom of your pool - based on how light it is, it does float slightly - but you will need to use the wrist strap or an additional floatation device to avoid the eventual Flip 4 Titanic. Sound-wise, the Flip 4 is a better speaker overall, and has more power behind it - it also boasts a slightly better battery life. But, if you’re looking for a cheaper, smaller alternative to the Flip 4, you can pick up the WONDERBOOM for $68. The next speaker we’re going to compare is another competitor from Ultimate Ears - the UE BOOM 2. The BOOM 2, which is currently sitting on our desk beside the Flip 4, is a slightly larger, slightly more powerful speaker. We would definitely argue that the BOOM 2 has more power, better sound, and a better experience overall, but at $125, it’s a bit of a jump for such a similar product. However, the BOOM 2 does offer a better multi-speaker feature called “Block Party.” This allows you to connect up to 150 BOOM speakers at once - a whole 50 more than the Flip 4. If you’re looking for a better sound experience, and want a better battery life - eight to fifteen hours - then go with the BOOM 2. But, if you’re on a tight budget, choose the Flip 4. Stay tuned for our in-depth review of the BOOM 2, coming soon. Then there’s the Bose SoundLink Color II. 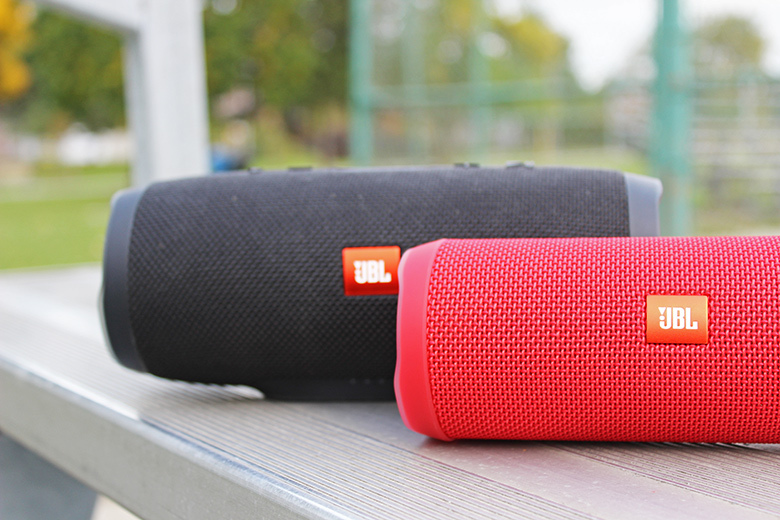 While many people are comparing the two speakers, they are pretty different, and we’d take the Flip 4 any day. For instance, the SoundLink Color II is not waterproof. It is IPX4 rated, meaning it’s splashproof, but we aren’t going to recommend taking this to the pool. While the SoundLink Color II might be roughly the same weight as the Flip 4, it’s odd shape doesn’t allow it the same type of placement, and it’s physically larger in size. The speaker must be standing or facing a certain way in order to hear the sound, and the drivers are smaller, giving you less overall volume. The SoundLink Color II has less battery life, worse sound, and is generally a worse choice than the Flip 4. At $129 for the SoundLink Color II, the $96 Flip 4 is an easy win. 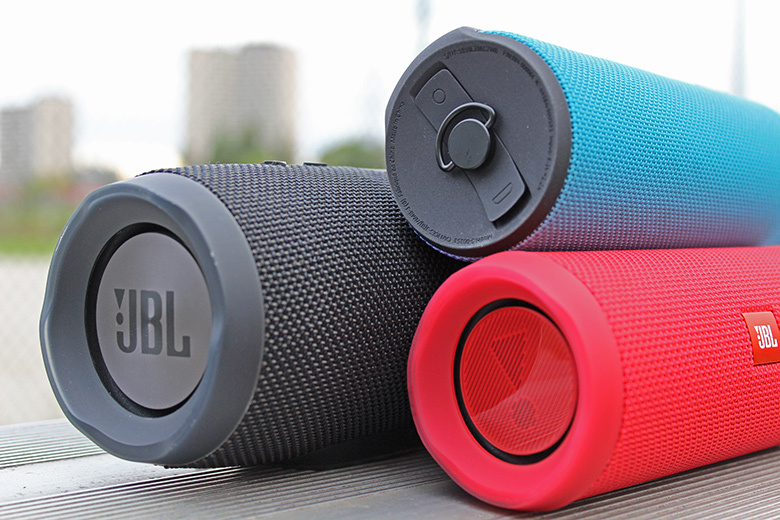 Last, but not least, we’re going to talk about the JBL Charge 3. As we mentioned previously, the Charge 3 is the big brother to the Flip 4, and is a better option all around. If you don’t mind the added size and weight, the Charge 3 has better sound quality, battery life, ruggedness, and utilizes almost all the same features. While the Charge 3 doesn’t have a JBL Connect+ button - this speaker was released before the upgraded app and feature set - the speaker itself can be updated to use the JBL Connect+ app. This means you can use Party Mode to connect to other JBL Connect+ speakers. The Charge 3 doesn’t have a wrist strap or a battery indicator, but for the upgrade in sound quality and battery life, we’d choose the larger model any day. The Charge 3 can be had for $120, just a smidge more than the $96 Flip 4.